Yesterday, like most Americans, I watched the game (and commercials) and enjoyed both. 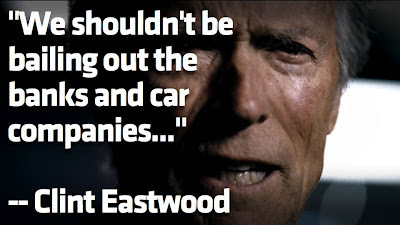 I thought the Clint Eastwood Chrysler ad at halftime was excellent. It never occurred to me that this was an overtly political ad, or endorsing Obama's re-election, or supportive of corporate bail-outs. Who knew? Apparently I am not sufficiently politicized to recognize the offensive polarizing nature of the ad. I naively saw the ad as simply a straight-line continuation of the theme and style of Chrysler's excellent "Imported from Detroit" Eminem ad last year. Common themes: Strength and resolve overcoming adversity; A focus on pride of place - Detroit for Eminem - generalized to America with Eastwood; Dramatic uplifting music; A popular, way cool, instantly recognizable celebrity emerging from the shadows at the end of the ad to deliver the money quote directly to the camera. They are practically the same ad. The purpose of advertising is to sell a product. The purpose of this ad is to sell Chrysler cars. Advertising sells cars by creating an image and cachet that buyers find attractive and associate with the car. This ad succeeds without ever showing the car. Chrysler had an image problem. Along with GM, Chrysler suffered a serious black eye with the American public. Cerberus - the private equity firm that bought Chrysler from Daimler Benz cut its losses by means of of a government bailout and a managed bankruptcy with heavy handed terms dictated by the Obama administration. At the end of the day, Chrysler was purchased by Italian car manufacturer Fiat, mostly because no one else would buy it. "Chrysler has one assembly plant in Detroit proper, two more in the suburbs, one each in Ohio and Illinois, two in Canada and two in Mexico. The Dodge Challenger glimpsed in the ad is built in Canada with a Mexican-assembled V8 and a transmission from Indiana. The company's cash is counted in Italy by Fiat, and its chief executive ... resides in Switzerland for tax reasons. It's one thing for any corporation to trumpet accomplishments; quite another to posit itself as the herald of a new morning in America. The sadder, harsher truth is that these pep rallies do much for Chrysler but little to abate Detroit's everyday horrors. If only the city called Detroit could metamorph as adroitly as Chrysler's concept of "Detroit." These ads are great because they succeed in wrapping Chrysler and their cars in the image of a resurgent Detroit and project a message of resilient Americans fighting out of an economic downturn - all delivered by respected and well-liked celebrity personalities. If there is a political message to found here, it has nothing to do with the advertisement itself. The ad is doing exactly what any good ad should do. Even more -Memeorandum found it, people are writing columns about it, it is being posted on blogs and social networks. Chrysler is getting their money's worth from this campaign. The political problem is with the underlying company. The problem is with the moral hazard unleashed when they were bailed out with taxpayer money. The problem is with the subsequent heavy handed politically motivated machinations orchestrated by the Obama administration in the bankruptcy proceedings. I would not want to buy a car from that company. I'd rather buy a car from that other company. That Halftime in America, Clint Eminem, Imported from Ohio Illinois Canada Mexico Detroit company. You know the one I mean... Fiat.